If you would like to receive our regular Newsletter via email, please fill out the form below and click on the Submit button. You may also use this form to unsubscribe from our newsletter emailing if you wish. Thank you. "Veterans Concert Tribute to Gen. Custer"
"It's Almost Time for the Show Band"
"Show Band Finds Temporary Home"
"The Show Band is on the Move"
"Show Band Explores Doo-Wop's Big Hits"
"Show Band to Honor Veterans"
"Show Band Celebrates Hispanic Music"
"Show Band's 'Celebration of Hispanic Music'"
"Show Band Getting Ready for Monthly Show"
"Beatles Concert is Set in Ontario"
"Ontario Heritage at the Square"
"Band to Perform at Outdoors"
"Group Gearing Up For Gershwin"
"Musical Salute to John Philip Sousa"
The Ontario Chaffey Community Show Band and Elegance Hair Salon are proud to present "Doo Wop Spectacular III" on Monday, April 15, 2019 in Merton Hill Auditorium, located on the campus of Chaffey High School, on the corner of N. Euclid Ave. and Fifth Street in Ontario. Early concert goers are invited to come at 7:00 p.m. to hear "The Woodwind Celebration," an ensemble of musicians from the Show Band. Complimentary cookies and Starbucks coffee will be served in the lobby. The concert begins at 7:30 p.m. and is FREE to the public. The concert will include a repertoire of well-known Doo-Wop hits featuring the exciting and talented vocal trio The Harmony Sisters and vocalist Jim Bonner. Also highlighting the program are the outstanding musicians of the Ontario Chaffey Community Show Band. The concert will be narrated by Assistant Superintendent of the Chaffey Joint Union High School District Chris Hollister and Chaffey District teacher Lara Porter. 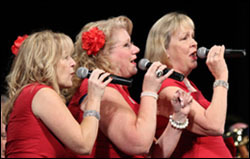 The Harmony Sisters include Chris McAleer, Stacey Rosen-Sturgis, and Beverly Crowe. They have been singing together since 2002 as the vocalists for the Bill Blanchard Little Big Band. Bill loved the music of the famous female trios like the Andrews Sisters and other groups and arranged the many intricate harmonies that you will hear sung by the Harmony Sisters trio. Each singer has her own style and brings decades of experience to the group. The group will perform as a trio, sing individual solos, and team up with Jim Bonner on several numbers. Jim Bonner is one of the most versatile singers on the local popular music scene. He is the patriarch of the Bonner Family Singers, a widely known vocal and instrumental group that performed throughout the country and recorded several albums of country music hits during the 80's and 90's. Over the years, Jim has performed with the Show Band on numerous concerts and currently provides entertainment for retirement communities throughout the Southland. As a trio, The Harmony Sisters will perform "Stop In the Name of Love," "Lollipop Lollipop," "It's In His Kiss," and "Only You." Each singer also will perform a solo number. Beverly will perform "My Boyfriend's Back," Stacy will sing "Please Mister Postman," and "Tears On My Pillow" will feature Chris. In addition, the trio will provide the background voices for Jim Bonner on "Lost in the Fifties Tonight" and "I Only Have Eyes for You." Jim will sing a vocal solo to the famous Platter's hit "Harbor Lights." 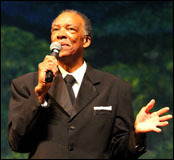 The Show Band will be featured on several Doo Wop instrumental medleys, and single hits that include "A Teenager in Love," "Oh What a Night," and "Poison Ivy." Join us for a great night of Doo-Wop music while having a hot cup of FREE STARBUCKS COFFEE, and put some green stuff in the Hungry Tuba. We will also have many of our DVD's available for a small donation. This concert will be broadcast on local Ontario cable Channel 3. Check your cable listings for the date and time. For additional information regarding these performances or the rest of Show Band's upcoming concert season, please check our website at www.showband.net and follow the Show Band on Facebook, Twitter, YouTube, and Instagram. The community can help support the Ontario Chaffey Community Show Band by becoming a patron of The Friends of the Ontario Chaffey Community Show Band Concert Society for $25. Become a Bronze Baton donor for $50-$100; Steel Baton $150-$200; Silver Baton $250; Gold Baton $500; Platinum Baton $1,000 and Diamond Baton $2,500. Individuals or businesses may also become a Show Sponsor for $2,500. For more information on sponsoring a show, contact director Dr. Gabe Petrocelli at gabe@showband.net. All Donor names will be included on every program and our website for the entire concert season. Baton and Show Sponsors will also receive complementary DVDs of each performance. The Friends of the Ontario Chaffey Community Show Band is a registered charity under Internal Revenue Code Section 501 C (3); EIN # 46-1422958. Checks may be made out to: Friends of the OCCSB, P/O Box 1512, Ontario, CA 91762. The Ontario Chaffey Community Show Band was founded in 1985 by R. Jack Mercer and is now under the direction of Dr. Gabe Petrocelli with assistant directors David Schaafsma and Pat Arnold. Band members represent at least two dozen communities throughout Southern California. Adult and student musicians are invited to participate. No auditions! Rehearsals are held on Monday evenings from 7 to 9:00 p.m. at the Chaffey High School Jack Mercer Band Room. The band performs monthly concerts in the Merton Hill Auditorium and at other venues throughout the community. All performances are free to the public.